Lateral Epicondylitis, more commonly referred to as Tennis Elbow, is a common injury that is easily treatable. Tennis elbow occurs when the tendons in your elbow come under too much stress by repetitive motions in the wrist and arm. This movement results in overloading your elbow and creating a painful sensation from your forearm muscles to your elbow. The name of this condition can be slightly deceiving because only a handful of people who get this injury actually play tennis. Anyone who has a job that requires motions that overload the elbow can be affected by Tennis Elbow. For people who have this condition, everyday actions like turning a door knob or holding a coffee cup can prove difficult. Luckily, Tennis Elbow does heal over time with proper diagnosis and treatment from your doctor. One treatment your doctor may recommend is to go to physical therapy to help reduce stress on the affected area. 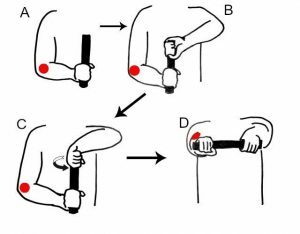 One exercise your physical therapist may recommend to help treat Tennis Elbow is the “Tyler Twist”. To perform the “Tyler Twist” all you need is the CanDo® Twist-n-Bend®. 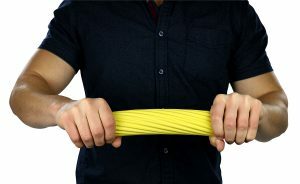 This tool is an exercise hand bar that comes in a range of color-coded resistances, great for wrist and shoulder exercises. The color-coded resistance range starts with the lightest resistance (yellow) to the hardest resistance (black). Once you’ve decided on your resistance level of choice, you are ready to practice the “Tyler Twist”. The “Tyler Twist” is a simple exercise designed to relieve pain caused by tennis elbow. First, grip the CanDo® Twist-n-Bend® from the bottom and hold it vertically in one hand. Then take the other hand, which should be the elbow in pain, and grip the top of the Twist-n-Bend® with your palm facing out. Next, twist the bar with your top and move the bar so that it is now horizontal. Stop twisting to finish this exercise. You should repeat the “Tyler Twist” until you feel some pain relief or until your doctor tells you to stop. 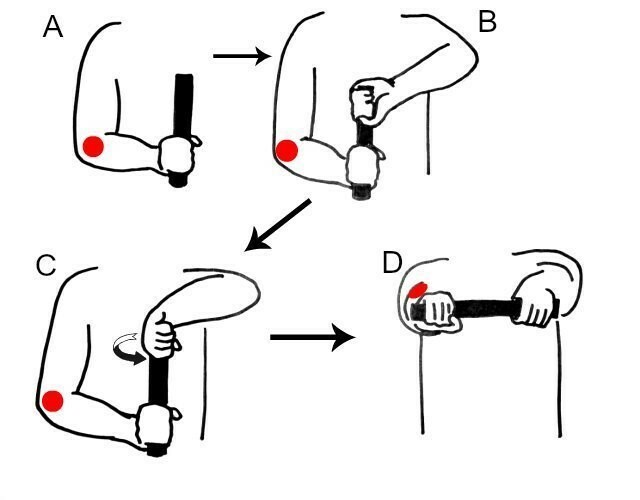 If you are in pain with Tennis Elbow, try to do a “Tyler Twist” exercise with the CanDo® Twist-n-Bend®! As always, please consult with your doctor before doing any activities to help your Tennis Elbow. For more information on Tennis Elbow, click here. To check the CanDo® Twist-n-Bend®, click here.